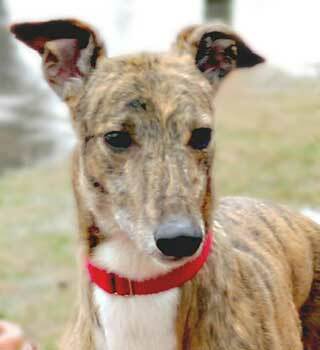 Hemi is an 8½-year-old red brindle male born April 2002 with a tuxedo blaze of white on his chest and throat. His registration number has been double tattooed, so his true identity will never be known. Hemi has quite a story - he was purchased for $10 out of the Greensheet in December 2006. The family who bought him had 5 children and liveed in a small apartment. GALT was contacted when they realized they were not able to care for him as he needed. Hemi was then adopted, but unfortunately through no fault of his own, it was not to be his forever home. 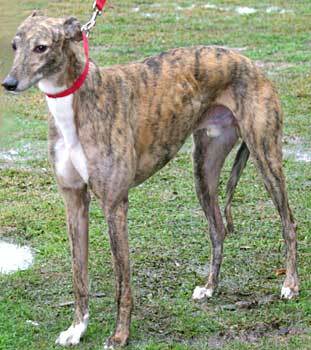 Hemi is a very mellow, easy-going greyhound with a delightful personality. He LOVES people! It is not known at this time if Hemi is small animal or cat tolerant.